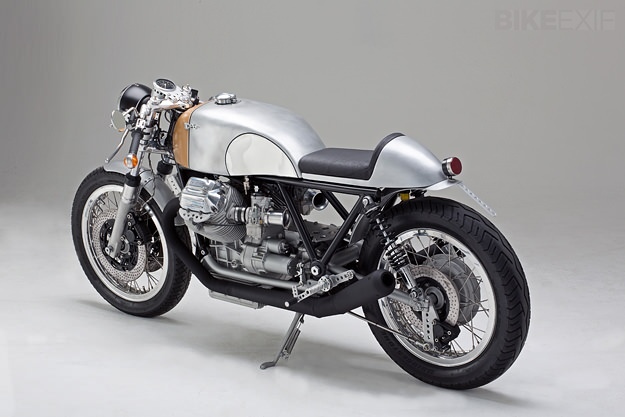 Every few months, a freshly-customized Moto Guzzi rolls out of Axel Budde’s Hamburg workshop. And you know what to expect: it will be stripped back, elegant, immaculately finished and powerful. 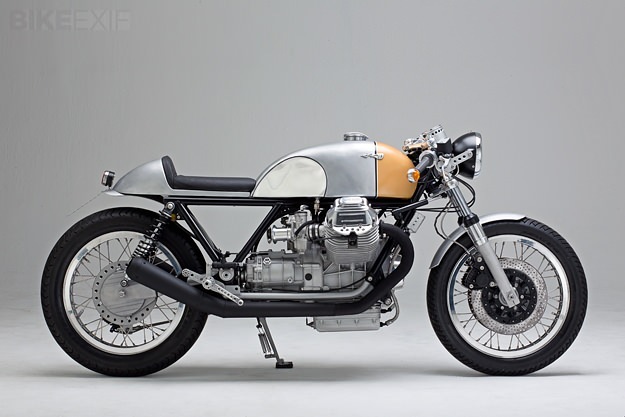 The donor bike was a Le Mans Mark III, which already had Mark IV heads and bigger carbs. Axel has upgraded the motor still further, taking it out to 1040cc with new cylinders. 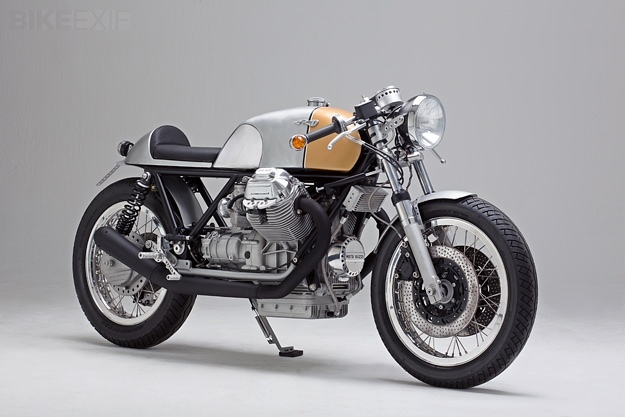 With the help of the tuning company HTMoto, he’s treated the Mark III to a dynamically balanced crank, a more sporting cam, twin-spark heads, electronic ignition and a bespoke matte black exhaust system. With engine output heading well beyond the stock 70-or-so rear wheel horsepower, Axel decided to upgrade the brake cylinders and hoses, and added progressive-rate springs to the forks. 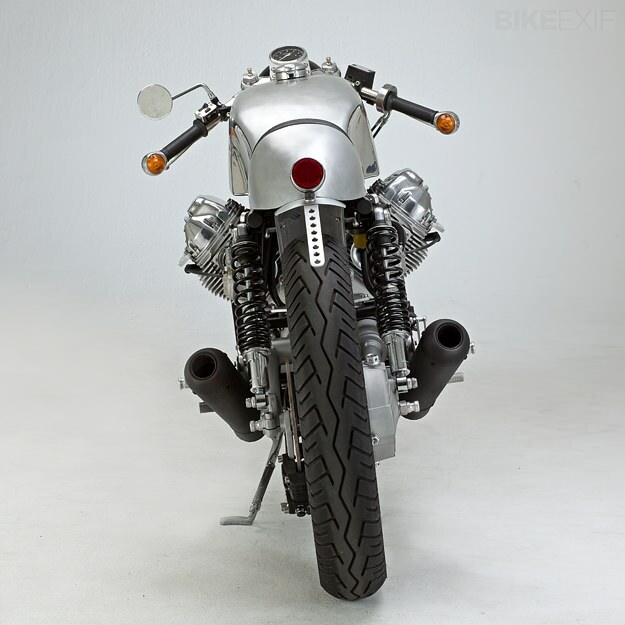 He also installed new rear shocks, custom-built by Ikon to his own specification. 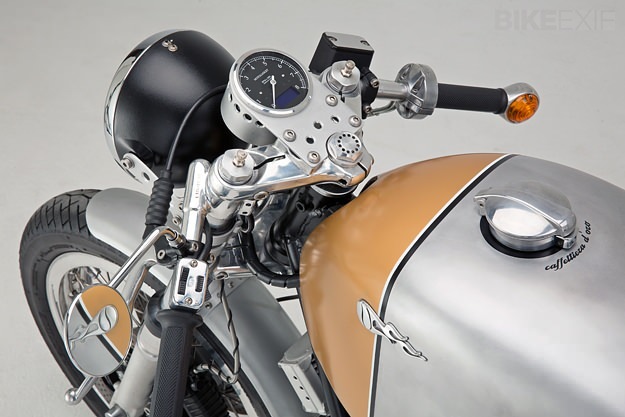 The original wiring was dumped in favor of a minimal custom loom, hooked up to a simple Motogadget tachometer. The lovely spoked wheels are Morad. Meanwhile, check out the Kaffeemaschine website for more details of Axel’s creations, and follow Kaffeemaschine’s news via their new Facebook page.